Your teen’s schedule is already filled to bursting with sports practices, homework for advanced classes, and—of course—enrichment activities that will supposedly “make her look good on college applications.” Your family has plenty of money to provide this girl everything she wants without her having to work for it. Should you just forget about the idea of her getting a high school part-time job? Here are three reasons why you might want to cheerfully give your teen an allowance that just barely covers her most basic expenses, ask her to cover all her own costs out of that, and in doing so help her to get hungry for part-time work. 1. The paying job is one of the fastest, most effective ways to teach a teen to use a calendar. How else will your son keep track of the random odd work shifts usually assigned to teenagers? He may only learn the importance of a calendar by having a fast food manager fly into a red-faced tirade at his accidentally missing a work shift. Using a calendar is one of the straightest, most direct routes to academic success in college. In general, students who use a calendar in college succeed. Those who don’t, flounder. Best to learn the discipline of using a calendar early on. The part-time job is a great motivator for that. In my recent post about the importance of the 20s I wrote emphatically about how important it is that students get practice early on stepping out into the world of work: interacting with customers, managers, and sometimes tedious or stressful work requirements that require focus, concentration, and discipline. Where does that start? In many cases it starts with stocking shelves, bagging groceries, and bringing shopping carts back from the parking lot. Is your son going to run a multinational corporation one day? I hope his first step in that direction won’t be an acceptance to Yale; I hope his first step toward that goal will be mopping behind the counter at the local Dairy Queen. It’s in teenage part-time jobs that a lifetime of workplace confidence takes its first breath. I want teens to start accumulating those experiences early on, by doing humble work. Besides all this, research shows that students who work while going to school get higher grades than students who don’t. That’s a good reason to get a part-time job! When you’re a parent, it feels great to know that you’re taking practical steps to set your kid up for successful college and career life. For clear, step-by-step help getting your kids through college debt-free, don’t rely on a loose collection of blog posts. You’ll miss hundreds of details that way. Instead, get your copy of my book. 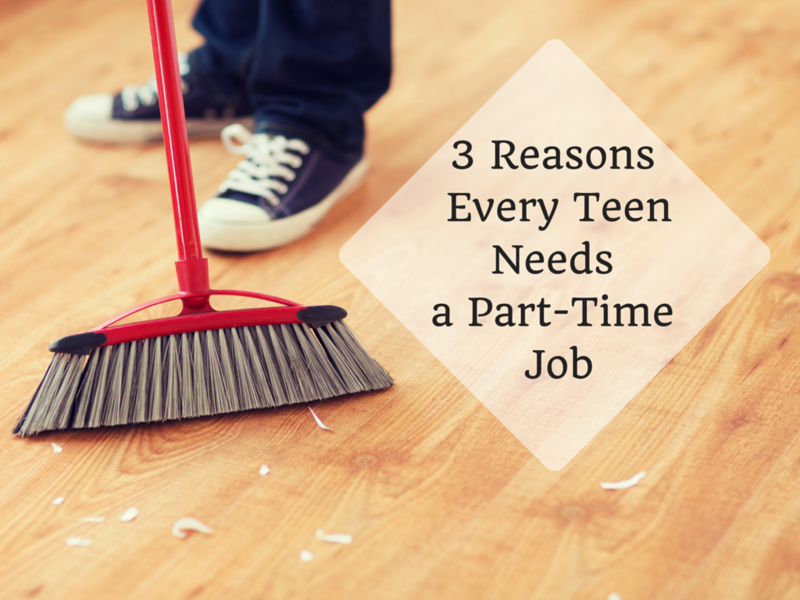 What do you see as the benefits and drawbacks to teen part-time jobs? Comment below or LIKE Jeannie Burlowski Author on Facebook, find this post on that page, and let’s talk about it there.